A quick announcement that Zelda: The Magazine of the Vintage Nouveau's Issue 4 is NOW available on http://www.zeldamag.com/ ! We have some special new things going on with the site- the first of which is an exciting new design! Check out Zelda's blog on our main page with Zelda and vintage news of all kinds! We are also excited to release the new Vintage Shopping Guide- highlighting some of the most exciting offerings from our sponsors! If you haven't gotten your hands on Zelda yet or would like to send issues to a friend, now's the time! We are proud to offer our four issue bundle (one of each issue 1-4) for only $25 domestic or $35 international! That's a $5 savings for domestic delivery, and a whopping $11 savings on international orders! All prices include shipping. Thank you for your support of Zelda, and I hope you enjoy reading issue 4 as much as I have enjoyed bringing it together! 11:56 am - Zelda : The Magazine of the Vintage Nouveau - Issue 3 Now Available! I wanted to let everyone know that the new issue of Zelda : The Magazine of the Vintage Nouveau is now available online! Our cover story in this issue is a never-published interview with Charles "Buddy" Rogers : known as "America's Boyfriend", star of 'Wings', and husband to Mary Pickford! There are amazing stories in this piece, including a tale about the very first Academy Awards. There's a sneak peak of some of our pages on the website as well as some bonus vintage recipes to try! 5:09 pm - Zelda's Vintage Resource List! MY VINTAGE SOLE - http://www.myvintagesole.com – Amazing vintage reproduction styles that are fully customizable! Choose your fabrication, heel heights, colors, and more! From Victorian boots to 1940s starlet heels, these shoes are all made on dance constructions for extra comfort during wear. I have two pairs, and ADORE them! NAUCK’S VINTAGE RECORDS – http://www.78rpm.com – Nauck’s is the definitive resource for vintage audiophiles, dealing in original 78s and cylinder records as well as phonographs. Nauck’s music auction catalogues are immense, but they’re also THE resource for supplies for audio accessories,record sleeves, phonograph needles, and more! ART DECO SOCIETY OF NEW YORK - http://www.artdeco.org/ - Attention New York (and surrounding area) deco lovers! ADSNY is a great way to meet other art deco ethusiasts, as well as a fantastic resource on deco in New York City. ADSNY organizes trips all around the metro area to explore landmarks and museums as well as offering lectures from experts around the world. Help preserve deco in New York, and join ADSNY! BESAME COSMETICS - http://www.besamecosmetics.com/ - Looking for makeup that not only features vintage colors and formulas, but also makes a stunning appearance on your dressing table? Look no further! My personal Besame favorites : cashmere powder (no shine all day- even holds up in NYC humid summer weather!) and Enchanting Lipsticks in Noir Red and Cherry Red! VINTAGE BLUE MOON - http://www.vintagebluemoon.com/ - For the find of a lifetime, visit Vintage Blue Moon! Daywear, eveningwear, accessories, swimwear – they have it all, and they have some of the very best. A great place to find pieces for special events when you really need a stunner! While visiting their booth at the Vintage Expo this year, I found what is now my favorite 40s evening dress...find yours at Vintage Blue Moon! MEDUSA’S HEIRLOOMS – 385 Fifth Ave, Suite 509, NYC NY 212.683.6711 – Looking for vintage style hair accessories for day or evening? Medusa’s is THE place to find it in New York City! Call for an appointment and visit Medusa’s showroom and get lost in a sea of crystal, lace, satin, and more : headbands, hair combs, clips, and accessories...proprietor Kathryn Hausman is also the president of New York’s Art Deco Society, and it shows in her designs! When dressing for a vintage event, I immediately visit my drawer of goodies from Medusa’s Heirlooms! FLAPPER FLOCK - http://www.etsy.com/shop/flapperflock – A division of Hobo’s Vintage, Flapper Flock is THE Etsy shop to know for offerings of clothing and accessories focusing on the 1910s-1930s. Nicole has it all: lingerie, dresses, shoes, beaded bags, picture hats- the works! (And all at very reasonable prices!) She’s also our Zelda representative in the Southern California area – find her with her paper moon at the Cicada Club in LA, Hobo’s Vintage in Redlands, and other vintage events to get your copy of Zelda! TOASTER CENTRAL - http://www.toastercentral.com/indexz.htm – Looking to put together that perfect vintage kitchen? Michael has the toaster, appliance, or decorative items for you! Toaster Central’s pieces are refurbished and in working condition (Michael also offers repair services for your vintage toasters). He also has a page of non-functioning pieces for ‘props’ and décor as well. One of my favorite vintage purchases this year : a 1920s Marshmallow Toaster from Toaster Central! FENHAM PUBLISHING - http://www.fenhampublishing.com/ - Fenham is an independent publishing house featuring the works of C.M. Eddy, Jr. and Muriel E. Eddy. Clifford is best known for his supernatural short stories (published in Weird Tales magazine) and was a friend and confidant to both H.P. Lovecraft and Harry Houdini. Their book, “The Gentleman from Angell Street : Memories of H.P. Lovecraft” is a must for any Lovecraft fan! DANDELION VINTAGE - http://www.dandelionvintage.com/ - Fun and affordable vintage clothing and accessories for all! From Victorian through the 1980s, Dandelion has it all- and at super reasonable pricing, no less! Perfect for the beginning vintage collector to that seasoned collector looking for a delightful steal! They have a great little beaded bag from the 30s for only $16 up now, and some perfect 20s silk slips for under $40! Yowzer! LICENSE TO SWING - http://www.jazzviolin.us/ - California jazz favorites Benny Brydern and John Reynolds bring you an album packed with feel-good 30s style swing! Tunes from 1887 to 2008 get a orchestration revamp on this album, and do they sound amazing when done in that 30s style! Catch Benny and John playing in California with Janet Klein & Her Parlor Boys, as well as in their own projects...and pick this fabulous album up at CDBaby.com! ARLENE’S ORIGINAL DESIGNS - http://www.arlenesoriginaldesigns.com/ - Arlene’s line of fun and affordable fascinators and headpieces make it easy to get ready for a night on the town or day strolling in your vintage best! The Garden Party style would be a smash at those vintage picnics, and I love my ‘Purple Marmalade’ tilted just so for some 30s drama. So many styles under $40, and all lovingly made by hand! DON SPIRO – http://www.donspiro.com – The master of vintage-style glamour portraiture, and Zelda’s official NYC photographer! His extensive background in lighting for film and television make him the finest choice for noir-style photos, and he has a long history in vintage-style pinup and boudoir photography as well. Get in touch with Don to capture yourself in that perfect vintage light. WIT’S END – http://www.clubwitsend.com – The monthly celebration of the Jazz Age in New York City! On the last Saturday of the month, Don Spiro and I bring you live hot jazz from some of New York’s best bands, a vintage cocktail menu, free beginner dance lesson, contests/giveaways, and a chance to wear your finest vintage evening attire. Bands we’ve featured at Wit’s End include Grandpa Musselman & His Syncopators, the Red Hook Ramblers, Gelber & Manning, Baby Soda, the Moonlighters, Molly Ryan & Her Debonaires, Cynthia Sayer & Sparks Fly, the Brian Newman Trio, Sly Blue & Jesse Selengut and more to come! Launch parties for each issue of Zelda are at Wit’s End- we’d love to see you there! THE RED HOOK RAMBLERS - http://www.redhookramblers.com/ - One of our NYC hot jazz favorites with that New Orleans flavor! The Ramblers can be found playing regularly in the NYC area, and are available for your private parties/weddings/functions as well. Hear the tunes, see the gigs, and get in touch with the Ramblers here! THE PINK BIRDHOUSE - http://www.etsy.com/shop/thepinkbirdhouse – Looking for the perfect gift for that gal who loves vintage lingerie? Or that bride who wants some early 20th century flair? Vintage-style garters and garter sets from the Pink Birdhouse is the answer! Their flapper girl garters are the sweetest (I adore my pair in peach), and Deborah is able to do custom orders as well. From traditional vintage styles to garters featuring charming vintage kittens and other animals; the Birdhouse is tops! LAUREN REDNISS - http://www.laurenredniss.com/ - Lauren is an amazing illustrator an author who helped make possible my interview with Doris Eaton Travis in issue 2! Her book, ‘Century Girl’ is an amazing pictoral biography of Doris’s life, and is an essential read for any fan of Ziegfeld and vintage glamour of that era. CLADRITE RADIO - http://www.cladriteradio.com/ - Our friends at Cladrite tees offer you Cladrite Radio – a fantastic site for vintage lovers with streaming radio as well as a blog featuring bits of delightful vintage trivia and commentary on books, films, and more! A wonderful bookmark in your browser to check regularly, and a great place to stream your vintage music online! ANOTHER MAN’S TREASURE - http://www.amtvintage.com/ - In the NYC area? Hop on over to Jersey City (up-and-coming so fast, I hardly recognize the place I once lived in 10 years ago), and visit Another Man’s Treasure! The store is a stylist favorite, and is chock full of not only clothing, but so much retro kitsch, it’ll make your head spin! Mention ‘Zelda’, and you’ll get 10% off of your purchase! Hurrah! I DESIRE VINTAGE POSTERS - http://www.idesirevintageposters.com/ - A treasure trove for lovers of vintage graphic art, posters, pochoirs, lithos, EVERYTHING! Every category is covered here with a broad range of art to choose from...they even have an under $500 section of impressive prints for budget-conscious collectors! Me, I’m into the Lepape pochoirs from the Gazette du Bon Ton, and the N. Greco black cat poster! FASCINATORS NYC - http://www.fascinatorsnyc.com/ - Super affordable and super wearable, this is a fantastic fascinator/headpiece resource for vintage mavens! Almost everything here is under $40 (with many under $20! ), and they’re versatile enough to wear with almost any outfit! For those of the crafting/DIY persuasion, you can add crystal, sequins, or anything you desire to these great basics! SOIREE - http://www.etsy.com/shop/soiree – Clothing and hat design with luxe vintage materials and design! Attention neo-flappers – these dresses are fierce! Made of vintage laces, bullion, beading, and more...Soiree also offers vintage evening hats that are to die for...there’s a gold sequin number in the shop currently that will make your head spin! Check back regularly for new designs and more fabulous evening hats! GEORGINA KELMAN WORKS ON PAPER - http://www.georginakelman.com/ - Attention lovers of fine prints and illustrations – Georgina specializes in works on paper from the Victorian Era through the Jazz Age. From George Barbier to James Abbott McNeill Whistler, she offers some of the finest original illustrations, lithos, watercolors, and more. You’ll want to dream your day away at a Parisian café after looking through her offerings...I’m still dreaming of that original Lepape gouache and ink drawing and a beautiful French etching of a flower market c. 1905. Le sigh! 11:24 pm - Seen this? 12:09 pm - Issue 2 of Zelda : The Magazine of the Vintage Nouveau! I would love to hear what you all think if you order the magazine! You can find Zelda online at http://www.zeldamag.com ! If any of you are in the NYC area, we're having an AMAZING launch party this Saturday for the second issue of the magazine. It's called 'The Moonlit Frolic', and there is information at http://www.clubwitsend.com . We will be featuring a showing of authentic Follies costumes, live music, prizes, and more ;) I would love to meet some of you stylish NYC vintage lovers! Nauck’s Vintage Records – http://www.78rpm.com one of the largest selections of 78s and vintage audio equipment/supplies around! Art Deco Society of New York – http://www.artdeco.org join today, New Yorkers! Hey Sailor! Hats – http://www.hey-sailor.com lovely hats, with a flair for evening headwear! Tiny top hat lovers, take note! Besame Cosmetics – http://www.besamecosmetics.com my favorite red lipsticks! I have 4 shades, and all in vintage perfection! Vintage Expo – http://www.vintageexpo.com attention Californians! The Santa Monica expo is coming up on Feb 6/7th! Show your copy of Zelda for $2 off admission! Vintage Blue Moon – http://www.vintagebluemoon.com a gorgeous selection of vintage apparel and accessories online! In January get 15% off with free shipping! Medusa’s Heirlooms – 385 Fifth Ave, Suite 309, NYC NY When in NYC, visit Kathryn and her amazing array of hair accessories! Her wares make their way into Henri Bendel and many of Manhattan’s finest stores! Gelber & Manning In Pictures - http://www.gelberandmanning.tv/ Enjoy G&M’s webisode 1 in a series of Jazz Age music and mystery! Featuring a NEW original tune from Gelber & Manning! Penellibelle - http://www.etsy.com/shop/penellibelle Handmade vintage-style wedding jewelry and headpieces – lots of gorgeous crystal pieces. Great for bridal OR a glamorous night on the town! Cladrite - http://www.cladrite.com/ Get your favorite vintage and retro graphics on tees! My personal favorite : Dora the Dunce! Bachelor Pad Magazine - http://www.bachelorpadmagazineonline.com/ Pinup gals and burlesquers galore! Cocktails, retro party planning, and more! Subscribe today! KD Design Studio - http://www.etsy.com/shop/kimkdep Handmade wedding/evening/special occasion jewelry with that perfect 1930s/40s flair! My current favorites include the Natalie Hair Clip and the gorgeous ‘The Magic of the Forest’ emerald green crystal bracelet! Gelber & Manning – http://www.gelberandmanning.com One of our favorite NYC ragtime/jazz musicians! Be sure to check their schedule to see when you can catch them live- you haven’t seen a duo like this before! Peek Jewelry & Hosiery - http://www.etsy.com/shop/cristinacascianoking More items coming soon- Cristina makes the most darling embellished knee socks! Red Hook Ramblers – http://www.redhookramblers.com Another NYC music favorite! Hot jazz in New York with a New Orleans kick! Check their website to see when you can catch them live! My Vintage Sole – http://www.myvintagesole.com Ever wanted a pair of CUSTOM reproduction vintage shoes? Choose from a lovely array of styles, and customize your color, fabrication, and heel style! It doesn’t get more custom than this! Nostalgic Corner - http://www.etsy.com/shop/nostalgiccorner Flapper Mannequins by Magda! I am dying to get my hands on one to showcase my jewelry and hats- perfect for a bedroom or boudoir! Leluxe Clothing - http://www.leluxeclothing.com/servlet/StoreFront Fantastic reproductions of 1920s eveningwear and more- and these you can dance in without worrying about the beads coming off! Get 10% off any order with code ‘ZELDA’! Vintage City Eyewear - http://www.vintagecityeyewear.com/ Find the best vintage eyeglasses/sunglasses/frames as well as Lafont’s retro collection! A fabulous rhinestone cateye pair of sunglasses is calling my name! Don Spiro Photography – http://www.donspiro.com Looking for a noir-ish glamour portrait? Don is your guy! Available in NYC and LA! The man I trust my portraits to AND partner in producing Wit’s End ( http://www.clubwitsend.com ) , the monthly celebration of the Jazz Age in New York! Flapper Flock - http://www.etsy.com/shop/flapperflock Jazz up your lingerie and wardrobe with a great selection of 1920s/30s dresses, sleepwear, hats, furs, and more! I Desire Vintage Posters - http://www.idesirevintageposters.com/ Purveyors of fine vintage and antique prints/posters/lithographs! Visit their ‘gift shop’ link for gorgeous pieces for those who want to buy vintage art on a budget! Hems and Bustles - http://www.etsy.com/shop/hemsandbustles Specializing in bridal headpieces, veils, and accessories – these fascinators are the bees knees! From art deco to Victorian influences – you’ll come away with a winner! Georgina Kelman : Works on Paper - http://www.georginakelman.com/ From the Victorian Era through the Jazz Age, Georgina has a beautiful offering of fine art prints from George Barbier to Whistler! My lustworthy item – Georges Lepape’s original gouache and ink drawing, “Les Coussins”, from 1912! I wanted to let you all know about a magazine I just started publishing...its called Zelda : The Magazine of the Vintage Nouveau, and we specialize in features/interests from 1900-1940! 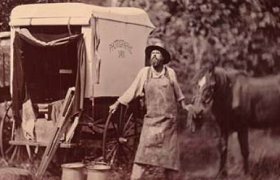 There are pieces on historical topics of the era as well as highlights of what's going on in vintage style culture today! I think there will be a number of pieces you all would enjoy....! You can see more and order at http://www.zeldamag.com ! 11:15 am - I love old things! This is my first entry ever, on Live Journal. What do I think about 'obselitism'? I have some old things at home, and I love them! I'm even starting a camera collection. I have a turntable, some vinyls (33's and 45's), some 8 tracks, and some tube amps and radios. I like to mix old technology with newer ones. Wish I could listen to my Ipod on my old 'Stromberg Carlson' AM radio! Project to come someday! - Sorry for my bad english, I'm from Quebec! I just joined the community last week. 6:49 pm - A guide to identifying silver/china dishes? I'm wondering if anyone is aware of a website that offers a quick how-to on identifying silver dishes that are NOT flatware (i.e. that are hollowware). I've found tonnes of sites that offer how-to-identify-flatware guides ("this is a macaroni server, and this is a bone fork..."), and likewise lots of guides on identifying maker/age/value, but nothing about dishes, whether china or silver. I ask because I have a few pieces of silver that are a bit of a mystery, and I can't really imagine what they're for. I've also got a few pieces of china that I can guess at, but I'd like to know for sure. To be specific, I'm looking for a dishes/hollowware equivalent of the flatware identification tables--something that will tell me that this is a finger bowl, and that is an asparagus-butter-dish, or whatever. The local branch of the library doesn't have any useful books, and my camera's being sulky, so an online guide is my best option for the time being--although alternative suggestions are of course welcome as well. 8:54 am - What do you think of this? To me, this managed to come off as a bit of WTF... the idea that people don't pay for long distance any more simply because they use a cellphone to make those calls, for instance. Somebody is not thinking. Particularly the reference to the NYPD typewriters. The real story makes a lot more sense, but all the news services, as usual copying from one another and not bothering to check it out for themselves, are playing up the bologna edition. 1:27 pm - What we want, is this. Where do we get one? Actually, two or three. ETA Related: Are there any actual dime stores (5c & 10c stores) left in the U.S.? We keep hearing that there are, but it's like an urban legend. 4:21 pm - One of my old things! technobabblegum Hello everyone! I'm a new member and of course I have quite a passion for old things so I thought I'd show you one of my precious darlings. 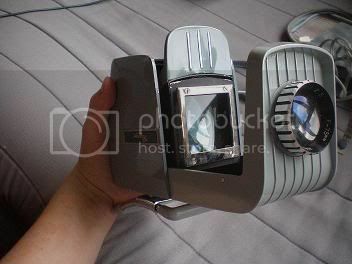 This is my projector... I think! 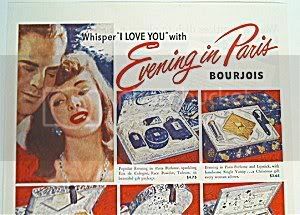 Evening in Paris Perfume, made by Bourjois in 1929, acclaimed as the most famous fragrance in the world. 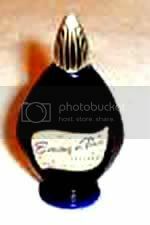 I have just recently began bidding on a vintage box set of this perfume and I am very eager to own it! Hi! By the way, you can call me Bebe. heytherestephy Hey guys, I'm new and I love the community already! Today I went out to check on our new house, also an antique! and we stumbled across an antique barn on the way, we pulled over and walked through it, and I noticed an old typewriter hanging out on one of the shelves. We asked how much for it, and he said $45.00, the keys work, and everything is in good working order. I've attacked it with the canned air, just to dust under the spools for the ribbon, etc. We bought a ribbon that was good for a newer underwood, and it fit into the old spools it came with, so it works now. Right now, we're looking at taking it to an appraiser, or someone who can tell me how old the typewriter is, etc. getting a job is the most obnoxious process. paper applications do not exist anymore. you have to do it online and half the time, the online applications don't work. i started one, made a mistake, hit the back button within the application and it crashed on me. now it will only let me go back to the one i started which always crashes at the same point. so because of modern technology, i cannot apply to safeway because my incomplete application is already in their system and their system is fucked so i can't complete it, no matter what computer i'm at. am i the only one this frustrated with the process of getting a job nowadays? i think these online things filter 'unqualified' people out and my lack of refrences prevents me from getting an interview in the first place. impersonal application processes do not equal jobs for good people. i can't even find the plain old all-purpose i-wanna-sell-yuppies-coffee-in-the-morning application on the (barf barf) starbucks website. threw_a_spark File under: People I want to be and/or emulate terribly. Let the fawning over sepia tones begin. Best viewed to the sounds of the Scarring Party.